Not too long ago I went back to high school. You’re probably thinking that that sentence is the thing of nightmares. Honestly, I would have to tell you, you are absolutely right. In high school, we were all once young wild and free. It seems like we didn’t have a care in the world and our diets consisted of pizza, burgers and hot dogs. Typical non-healthy high school eating habits. However, we’re adults now our palates are refined and we’re feeling a bit nostalgic about the past. So where do we go? It’s only best that we re-live the glory days at Wicker Park’s Saved by the Max. Due to popular demand, the pop-up Saved by the Bell themed restaurant is staying in Chicago for one final semester. It seems like getting a reservation has been nearly impossible. But for the many who have made it through the doors of Bayside’s popular hangout, it’s well worth the wait. Walking in, it feels like one was sucked into a time machine to the 90’s. The sounds blaring through the speakers are classic hits of the iconic decade. My personal favorites are the hip hop days of Will Smith and Bel Biv Devoe’s Posion. TV screens behind the bar play classic episodes of the hit TV show. Who can ever forget the episode when Jessie finds herself addicted to caffeine pills? Saved by the Bell kept it very real. At the entrance of the restaurant are the lockers of our favorite characters. It’s like the students of Bayside never left since the lockers are filled with 80’s clothes and love notes. Even the bathroom has touches of nostalgia with information about cheerleading tryouts. You could even pose with cutouts of Slater and my fave Lisa Turtle. If this was your favorite show, you were in absolute heaven. The Bayside gang’s hangout is bathed in vibrant colors making it enticing for even those who weren’t born during this time. I remember seeing families with kids when I went which means generations are taking the time to introduce others to the classic TV show. While everything takes place in this diner themed restaurant, we’re going beyond burgers and fries. Let’s just say the Saved by the Max team is redefining the foods high schoolers would love. Joining me was none other than fashion blogger Hayet Rida. We kicked off our meal with the most delicious appetizers that Bayside had to offer; Snow White and the 7 Dorks and Mac and Screech. The 7 Dorks are your classic tangy BBQ wings. When dipped in blue cheese or ranch they make the absolute perfect start to any meal. If you love wings, then you won’t be disappointed when ordering this dish. Next, was the Mac & Screech. First off, let me say that the Mac & Screech is exactly how macaroni & cheese should be; extra cheesy. This recipe is so perfect. I would argue that it’s one of the best tasting macaroni and cheese I’ve ever had. My mom may have some serious competition. While the pop-up won’t be here for long, I really hope this divine recipe for Mac & Cheese lives on in another Chicago restaurant. It’s that good so it’s a must order. For our main dish, I’ll admit that we indulged quite a bit. I ordered Leon’s Lobster Roll. A slight crisp split top roll featured an abundance of the finest Maine Lobster. While oozing with delicious under the sea flavor the roll also featured a generous drizzling of aioli and orange zest. I had no problem finishing this dish. Let’s just say that there were no leftovers and you can’t go wrong with this fulfilling entree. Hayet had Tori’s Fried Chicken. The fluffy coconut milk waffle was infused with Goose Island 312 topped off with a crispy piece of Korean Fried Chicken. And of course, you can’t forget the syrup. Tori’s Fried Chicken comes with spiced maple syrup. For a new twist on the classic chicken and waffles, Tori’s Fried Chicken is worth trying. While both dishes were delish, you can’t leave the cafeteria without trying the burger. Meet the classic Bayside Burger. It’s a popular dish on the Saved by the Max Menu. It has your typical ingredients American cheese, kewpie mayonnaise, lettuce etc. However, this burger was prepared to perfection. For all you burger lovers, you won’t be disappointed with this classic American dish. While the appetizers and mains will certainly leave you more than satisfied, you absolutely cannot leave without having a taste of something sweet. Might I suggest Mr. Tuttle’s Float or a Lisa Turtle Milkshake? Both Hayet and I’s glasses were filled with pure yumminess. While incredibly full, we couldn’t leave without a little taste of serendipity. High school may not have been the best time for everyone but it was all good times at Bayside’s Saved by the Max. 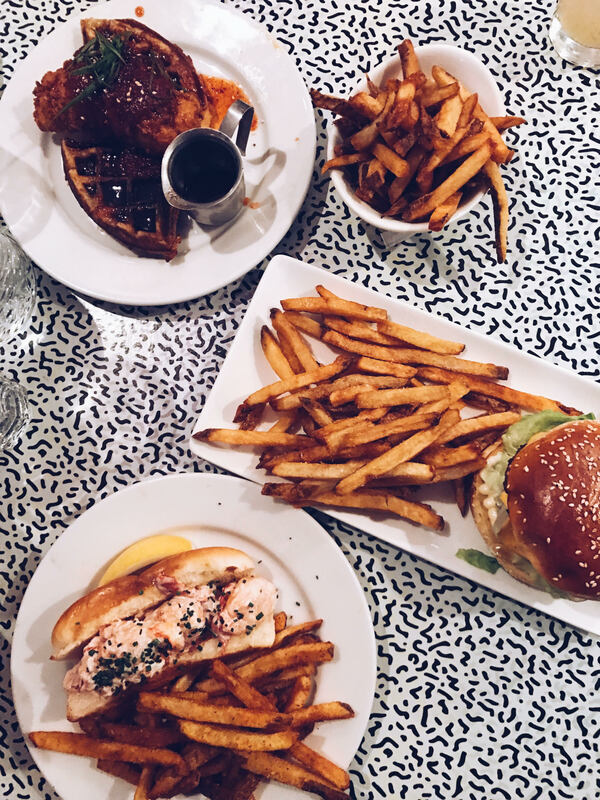 Be sure to check it out the most raved about pop-up before they leave Chicago for good! Last day for reservations is May 27th. *Food was provided complimentary by Saved by the Max. All opinions are my own.